…On 17 March 1982, three months before I took up my post as thea first director of the new Netherlands Institute for Human Rights (SIM), the world – and especially the Netherlands – were shocked by the kiliing of a team of television journalists of the TV channel IKON in El Salvador. The very uncivil conflict there had already costs thousands of people their lives including the internationally known cases of the 4 American nuns and the progressive bishop Oscar Romero 1980. The USA under Reagan had clearly changed course and was openly supporting the Duarte regime against the left-wing rebels. The Dutch government – especially its ‘atlanticist’ Minister of Foreign Affairs Hans van de Broek– was caught between its desire to appease the US government and to respond to the public outcry back home. 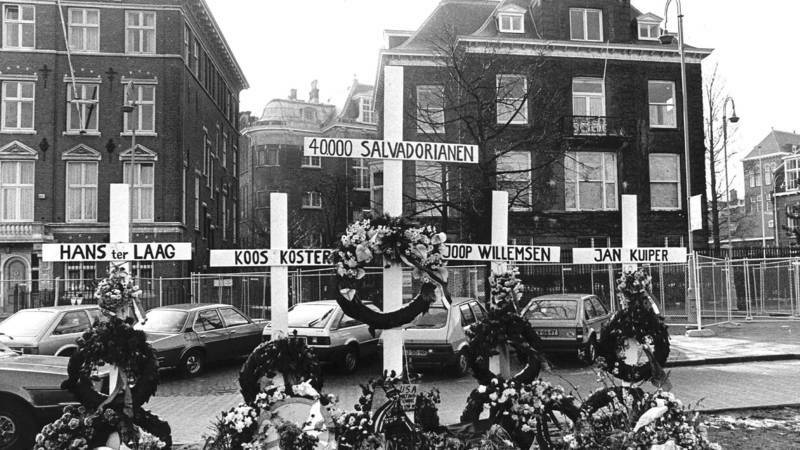 The compromise reached was that the Dutch Ambassador from a neighbouring country (Jan Willem Bertens) was exceptionally allowed to undertake an investigation on Salvadoran territory, but – if no evidence of government involvement was found – that would be the end of the affair. The fact-finding mission by the Dutch Ambassador did not find any strong evidence; the report was left with the Salvador government and submitted to the Dutch parliament. One of the first visitors to SIM was Yata Matsuzaki who was the partner of one of the journalists killed and on behalf of the families – who were not convinced by the inconclusive Bertens report. She asked me to take on the case and see whatever else could to done to keep the matter alive. There was even some money set aside for this by the families which was very useful as later – when the Dutch Minister Van der Stoel queried whether this kind of activity (i.e. second-guessing him) was within SIM’s mandate – I was able to refer to the fact that SIM was supposed to find externally funded projects and this had been one of them. In fact, I had to scratch the bottom of the barrel to find ways to keep the case alive but fortunately the UN had just establish a “Special Rapporteur on extrajudicial, summary or arbitrary executions”and I submitted the case there. With the help of the Lawyers Committee for Human Rights in NY I also tried to obtain copies of relevant telexes from the US State Department but most was blacked out. This involvement with El Salvador led SIM to start a project on how to count human rights violations in general (with initial focus on Central America) and we tried to solve difficult issues such as killings by non-state actors and defining indirect victims. One of the persons helping in El Salvador was Marianella Garcia Villas who had come to SIM in early 1983. I offered to help her with obtaining political asylum in the Netherlands, but she insisted on going back as she was most needed there. I felt not just sad and shocked but also ‘guilty’ when soon after her return she was murdered. 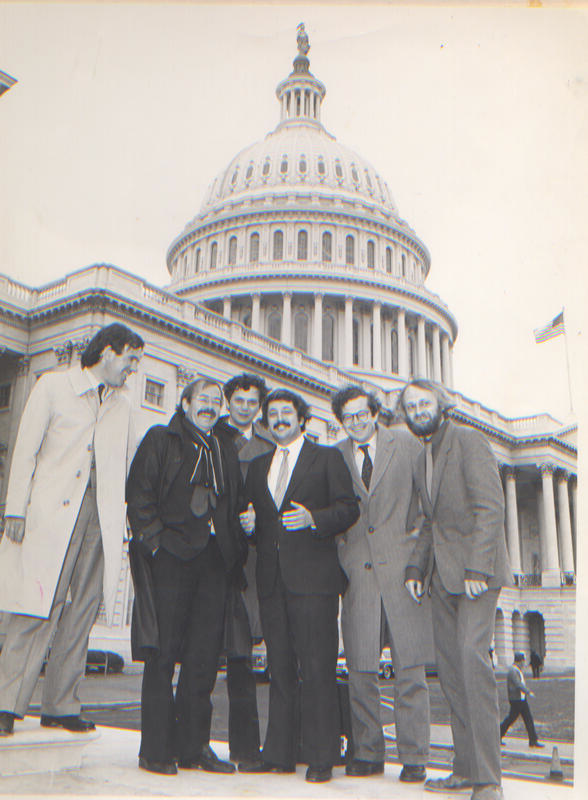 Then in May 1984 three Dutch parliamentarians (one from each main party) accepted to go on a mission to Central America (and the USA see picture) and I was asked to join as an independent ‘expert’. It became a memorable trip, including a shooting incident on the road in Nicaragua, but what crowned it was that in El Salvador I got a chance to meet with the Prosecutor’s office that was in charge of the IKON investigation. They kindly showed me the file and I was shocked to see that it contained almost nothing and especially that the report by the Dutch Ambassador – 2 years later! – had not been translated into Spanish. Upon arrival in Schiphol airport, there was a well-attended press conference and when there were questions about the IKON investigation the parliamentarians agreed that I should answer as an independent expert. The journalists had clearly not forgotten their colleagues and fielded many questions. When asked what the Dutch government should do now, I replied that it is was time to re-open the investigation and that my colleagues on the mission representing a majority in parliament were well placed to formally ask for it, which they promptly said they would. When soon afterwards a majorly in parliament adopted a motion requesting this, the Minister of Foreign Affairs was not pleased and initially refused to carry out the motion. However, as this was not worth a government crisis the Prime Minster Lubbers engineered a compromise under which the Dutch government would follow up and at least translate the text. A team of the Dutch television programme Zembla has traced the former colonel of the Salvadoran army, Mario Reyes Mena, who ordered the killings. The now 79-year-old Reyes Mena has been living in the United States for four years. Zembla found him through his three adult children, who are active on social media. When confronted he claimed that the amnesty pronounced by the government of El Salvador covers his actions. However this amnesty law was cancelled in 2016. In August 2017, the investigation into the murders was already reopened administratively. Two Salvadoran human rights organizations, ‘Fundación Comunicándonos’ and ‘Associacíon de Derechos Humanos’, urged the Salvadoran judiciary to carry out the investigation and the ensuing prosecution.Gert Kuiper, de brother of one of the killed journalists has also started a procedure against the colonel and the Dutch Ambassador in El Salvador supports the move. It is not known where we stand with this investigation but interesting is to note that in November 2017 another former Salvadoran army colonel, Inocente [SIC] Orlando Montano, was extradited from the USA to Spain to face charges relating to the 1989 killings of the 6 Jesuits priests. Killings cannot have happy endings but justice is the next best thing. He succeeded in May 1982 the socialist Van der Stoel whose initial reaction to the killing had been more forceful. This entry was posted on	September 25, 2018 at 19:43	and is filed under human rights. Veel dank. Ik heb problemen met mijn computer en ben je “bloedeigen verhaal” kwijt dat je schreef toen je directeur was van SIM. Ik wil dit verhaal nog doorzenden aan mijn goede vriend prof. Harmen van de Wilt ( UvA ), die zich onlangs in Trouw uitvoerig uitliet over de IKON journalisten en die , denk ik, juw verhaal goed kan situeren.